Description: In a parallel world reminiscent of our own WWII era, pilots take to the skies with stylized aircraft carriers and devastating weaponry! Inspired by the wildly popular 80's arcade series, all new 1942: Joint Strike combines classic top-down vertical shooter gameplay with updated 3D HD graphics and online play. Skillfully maneuver your aircraft to take on massive waves of incoming enemy fire while ducking and dodging explosions and missiles! Face off with huge enemy bosses in death-defying dogfights. Recruit a wing man locally or online to work together and pull off new “Joint Strike” attacks, combining the powers of both aircraft in one explosive barrage. With new weapons and power-ups in your arsenal, prepare to rejoin the battle! 09-12-2014 navxela Description In a parallel world reminiscent of our own WWII era, pilots take to the skies with stylized aircraft carriers and devastating weaponry! Inspired by the wildly popular 80's arcade series, all new 1942: Joint Strike combines classic top-down vertical shooter gameplay with updated 3D HD graphics and online play. Skillfully maneuver your aircraft to take on massive waves of incoming enemy fire while ducking and dodging explosions and missiles! Face off with huge enemy bosses in death-defying dogfights. Recruit a wing man locally or online to work together and pull off new “Joint Strike” attacks, combining the powers of both aircraft in one explosive barrage. With new weapons and power-ups in your arsenal, prepare to rejoin the battle! 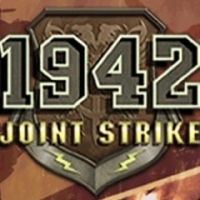 This is a list of VGCollect users who have 1942: Joint Strike in their Collection. This is a list of VGCollect users who have 1942: Joint Strike in their Sell List. This is a list of VGCollect users who have 1942: Joint Strike in their Wish List.